Christmas is the best. Or at least I think it is. It’s all about test Cricket, long days, sunshine, ham, presents, hard work and even harder play. For me, Christmas feels like the absolute pinnacle of the year, when everything is just that little bit better, with everything – including the quality of the booze – turned up a few notches. These three, fittingly, all hit the festive high notes. Christmas worthy booze all round. For mine, Albert Mann makes some of the most consistent wines in Alsace, producing classic styles with simple, wonderful balance. I’m a fan, and this is the sort of wine that I really love drinking. From the first whiff, this is just so obviously a goodl Alsatian Riesling. Honey, slate, tangerine and just a whiff of cream. It smells quite rich but not fat, without the severity of many brethren from the German side of the river, if equally not quite as linear. What is most interesting (or I though it was interesting) perhaps is that whilst it tastes off dry, I don’t think it actually is. It carries that perfect tension of acid and sweetness through the back end that I’d usually associate with something with some more residual sugar. But there’s also a firmness to the finish that is much more drive and nerve. 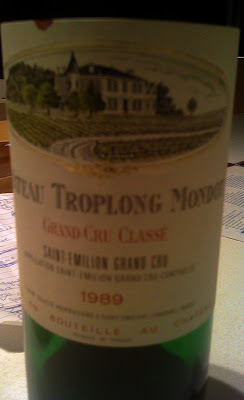 Regardless, the overall effect is of richness, weight and acidity, everything sitting rather perfectly indeed. And now for something completely different. Admittedly this isn’t a superstar of the Aglianico world, what it does have is plenty of flavour. It kicks off with a nose that of fruit cake. Of Christmas fruit cake, cut with sweet cocoa powder oak and dusty overtones. It smells ripe, porty but not stewed, a product of a warm climate but not overripe grapes. Important distinction that. The palate too is quite chunky, fleshy and weighty, with some somewhat heavy handed coffee oak and some caramelised, oxidative edges. It’s a mouthful alright, with a ripe and warm style that is hearty and satisfying. Snaffled from a very serious cellar, this has been stored in near perfect conditions since release. It looks it too, with a very solid colour for its age. Speaking of age, it’s the nose where the 21 years are evident, with cedar, pine resin, dusty red fruit and rose water, all set in a quite developed, spice and undergrowth style. It’s a feminine nose ultimately, with an unforced ripeness and still recognisable fruit purity that is rather appealing. serving to intrigue and distract all at once. It’s fully resolved, elegant and silken on the palate too, with that mid weight, power-without-heaviness that old Bordeaux does so well. Tannins are drying out a fraction, but it’s entirely welcome to see them still evident on the palate. If anything this has a bit of a donut going on, with something of a dip in the mid palate. Regardles,, the form is pure, ripe and rather lovely. Unforced lovely. Drinkable lovely.